Emirates' may be an Arabic airline but there is a full bar service, and you ask for a beer on board. Indeed, the drink selection is better than many American airlines. Wine, beer and spirits, are free. 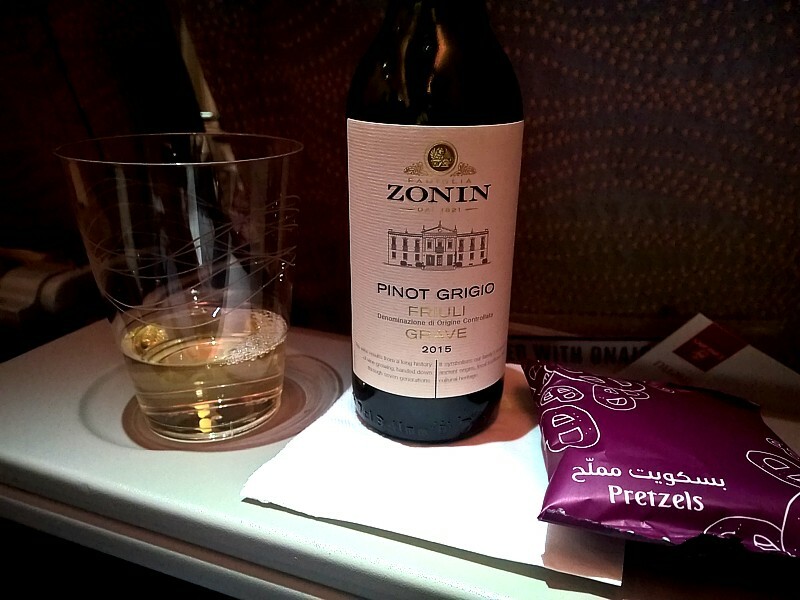 In economy Sparkling Wine is 20Dhs. 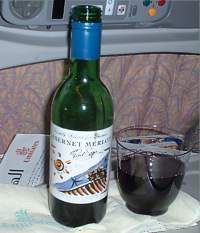 All wine in economy comes in minature 185ml bottles, and all beer is opened for you at your seat. 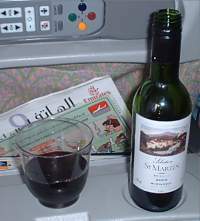 There is a full drinks menu on page one of the inflight menu handed out in all classes. Even in economy, Emirates serve a very good cocktail selection. There is a choice of Vermouth (sweet or dry), Martini (DRy only), Sours (Whisky, Gin, Brandy or Gin Fizz), Highballs (Gin & Rum) and a Sparkling Wine Cocktail. Emirates Bloody Mary is justly famous in Economy, for the care and attention the crew lavish over this, one of the most sought after drinks on board. When you order one, even as part of the normal drinks run before dinner, a member of the crew is sent to the galley for you, and comes back with a trolley of all the ingredients. 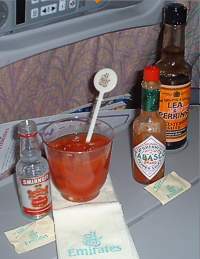 On your tray table (even in economy) they will lay out the vodka, the Tabasco, salt and pepper, and the Lea & Perrins, so you can mix it how you like. I love this. It's one of my favourites on the plane. Cabernet Sauvignon is the classic grape of Los Vascos' vineyard and is the variety on which the estate has built its reputation. The common feature of all the vintages is ripe fruit, fresh aromas, and a supple, full-bodied structure. This wine has a sparkling ruby red colour and a pleasantly fruity nose with aromas of black cherries, raspberries and plums, all with a hint of spice. A silky, flavourful wine, with nice formed legs, that balances extremely well between fruitiness and tannins. It ends pretty tart. A lovely French red with a lot of body and some spirit. An otherwise anonymous French red. Delicately fruity, relatively full and ample with an ensemble of aromas of great finesse. Appealing straw-yellow color green with delicate reflections. Lightly dry yet extremely fresh. 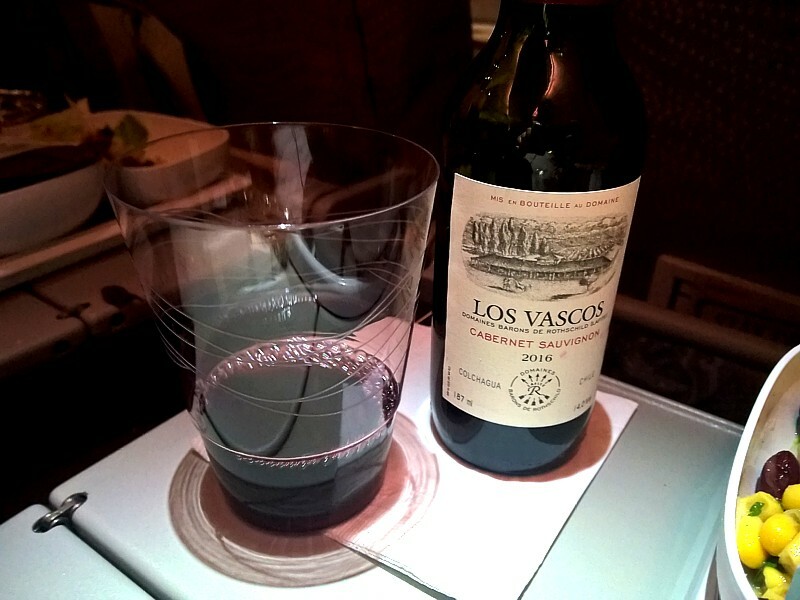 Its pleasantly balanced and elegant structure makes this an unusually refined and aristocratic wine, ideal for flying. 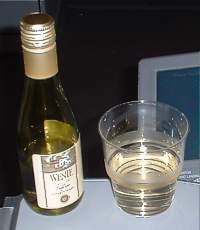 An unusual choice for an inflight Chardonnay, the Wente from Livermore in California is an Emirates special, and comes from the family run vineyard that was planted (as the label is proud to tell you) way back in 1936. It's pretty good, with more body than normal. 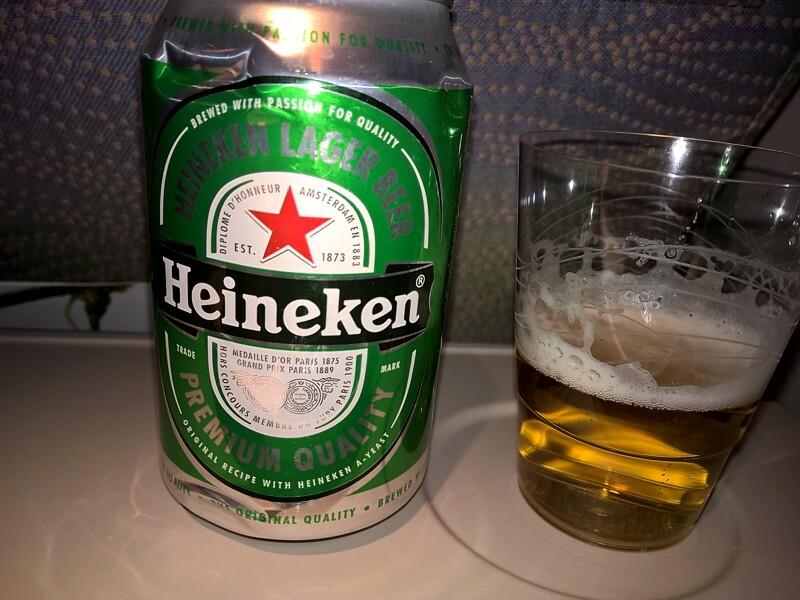 Emirates serve Heiniken beer. Maringally better than the Carlsberg, it's still a tame beer with little to recomend it. 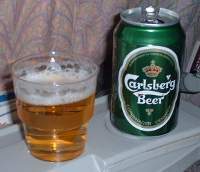 Emirates will happily serve you a Carlsberg. It's the usual dull stuff you get on the ground.